Just two of the scores of quotes following the launch of Inspiring Dorset. 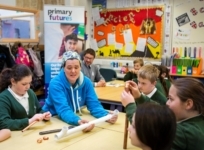 On 3 April we held a Primary Futures event at Holy Trinity Church of England Primary School & Community Nursery followed by a speed networking event as part of our Inspiring the Future programme on 4 April when we visited All Saints Church of England School. Both schools are in Weymouth. 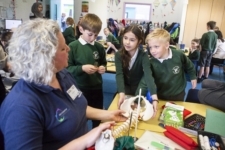 More than 50 volunteers from a wide range of companies across Dorset came into the schools to share the stories of their career journeys with the children. Many brought props. Lottie, (pictured) a female plumber, had students re-assembling pipes. Brian, the pest controller along with his dead rat, encouraged the children to dress up in his protective gear – which they loved. Further helping to address social stereotyping, we also had a male nurse and a female Orthopist. We are running the Inspiring Dorset campaign with Dorset Council, Southern Universities Network (SUN), Dorset Local Enterp rise Partnership (LEP) and the Careers and Enterprise Company (CEC). 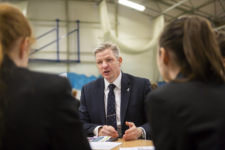 We were delighted that Matt Prosser, (pictured), Chief Executive of Dorset Council and Sarah Parker, The Executive Director of People-Children at Dorset Council both found time from their busy schedules to join us at the secondary school event on Thursday to share insights into their careers and the wide range of roles within the council. 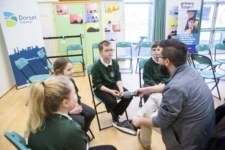 Inspiring Dorset is connecting volunteers from the world of work with local schools by the state of the art online platform – Inspiring the Future. At both events head teachers from other local schools were welcomed and have now signed up to the Inspiring Dorset programme and plan to hold events in the summer term. 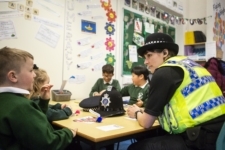 Our volunteers, who were themselves inspired by the event, have promised to not only visit more schools but also to spread the word amongst their work colleagues and friends. So, we are very excited about the programme going forward.